(P1) Horses are able to DISTINGUISH between happy and angry human facial EXPRESSIONS, according to research. (P2) In an experiment using photographs of male human faces, scientists from the University of Sussex showed that domestic horses “responded negatively” to angry expressions. (P3) The scientists say DOMESTICATION may have enabled horses to adapt to and interpret human behaviour. (P4) The team carried out their tests at riding STABLES – presenting large photographs to a total of 28 horses. (P5) “One person presents the photo while another holds the horse,” explained researcher Amy Smith. (P7) Mammal brains are wired such that INPUT from the left eye is processed by the right side of the brain. (P9) The researchers also fitted the horses with heart monitors, which revealed that angry faces caused their heart rates to rise significantly. (P10) Similar results have been reported recently in domestic dogs, raising questions about how living with humans might have influenced animals’ abilities. (P11) While horses might have an INNATE ability to recognise emotions in each other, their domestication by humans could have caused them to adapt that ability to humans. 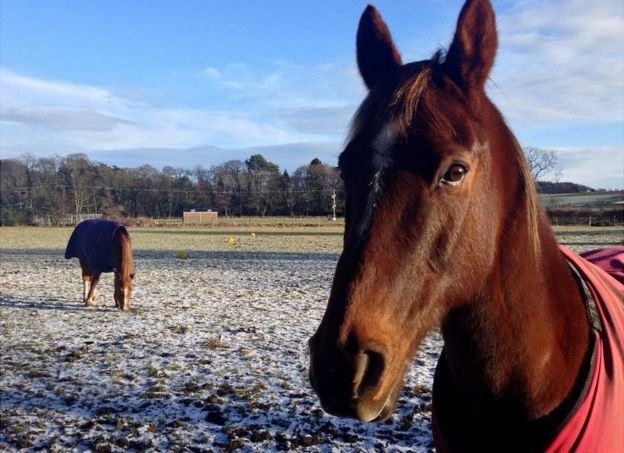 (P13) Prof Debra Archer, an EQUINE VETERINARIAN at the University of Liverpool, said that anyone who was around regularly with horses would recognise that their behaviour had a “marked impact” on the animals. (P15) Gillian Higgins, another equine expert who runs the organisation Horses Inside Out, agreed. (P16) “When I’m RELAXED, the horses will be relaxed. And if someone comes in who is stressed and nervous, they will PICK UP ON that,” she told BBC News. These FINDINGS will not come as a surprise to anyone who lives with animals. Do you own pets, and do they pick up on your MOODS? Are you a “dog person”, a “cat person”, or neither? Why are domestic animals so different from wild animals?